Norway Takes The Lead In Electric Cars (With Generous Subsidies) : Parallels Next month Norway is expected to become the first country where 1 percent of the cars are electric. Most Norwegians are supportive, but it's taken large financial incentives to reach this level. Jonette Øyen with her Nissan Leaf outside the National Archives in Norway, where she works. Next month Norway is expected to become the first country where one in every 100 cars is purely electric. 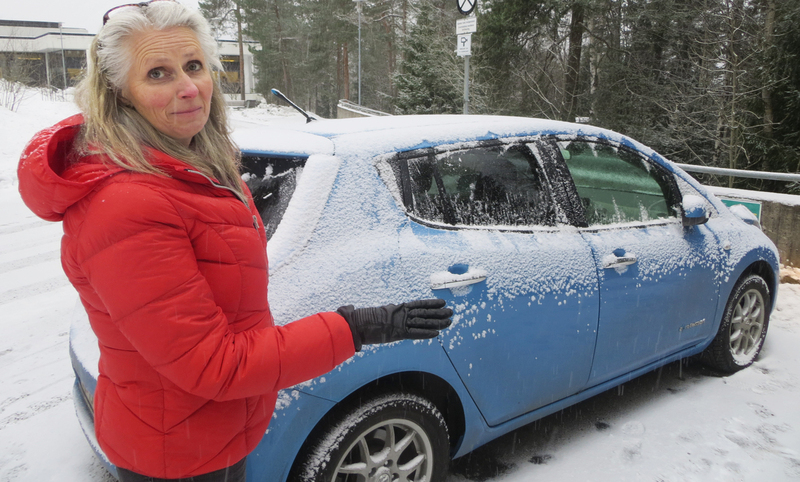 When Jonette Øyen bought her first electric car, it turned heads. "Now nobody turns around!" she says with a laugh. Sometime in April, Norway is expected to become the first country where one in every 100 cars is purely electric. One percent may not sound like a huge figure, but in the U.S., the equivalent number would be something close to .07 percent. Driving around Oslo, it's a number that becomes quickly visible as Øyen interrupts herself every minute or two to point out another EV passing quietly by. Popular electric vehicles in Norway include the Think and Buddy, which are both produced by Norwegian car makers, as well as Nissan's Leaf and Tesla models. This is all started years ago, when Norway had a fledgling electric car industry of its own. In an effort to boost sales and reduce emissions, the Norwegian Parliament put forth a very generous package of incentives to get its people off fossil fuel. The big one: no taxes. In a country where taxes can double or even triple a car's purchase price, that's huge. Still, as Transport Minister Ketil Solvik-Olsen explains it, those were the days when electric meant "tiny, kind of plastic cars seating two people, where you would freeze to death during the wintertime." He says that while the pitch appealed to early adopters and environmentally conscious people, sales were not about to rise dramatically in snowy, mountainous Norway. Parliament decided the tax break would end when the country's EV total reached 50,000, or in 2017, whichever came first. By 2013, Norway's electric car industry had pretty much fizzled, but California-based Tesla was cranking them out, kickstarting other major automakers into action. With EVs on the market that some consumers actually wanted, suddenly those tax incentives became a lot more alluring. In September of last year, Norway becomes the first country ever to have an all-electric vehicle top the monthly best-seller list: the Tesla Model S. In October, it was a different all-electric model: the Nissan Leaf. The perks of EV ownership in Norway go on and on: no tolls, free use of the bus lanes, free parking, free ferry rides and free charging at municipal stations. 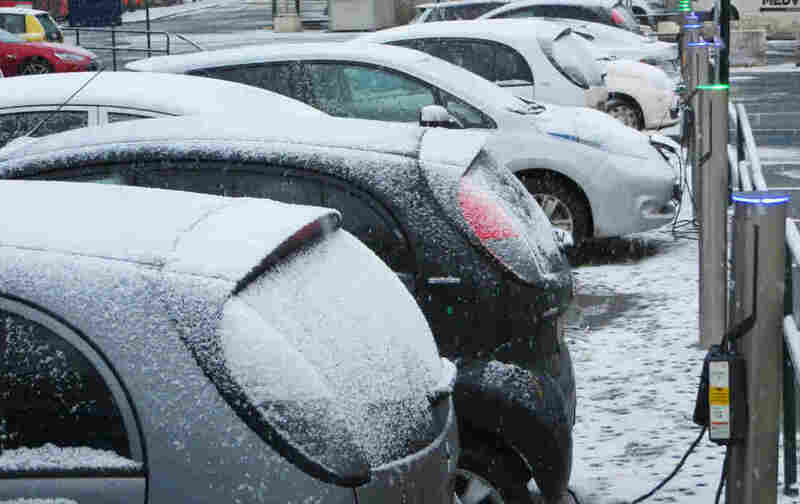 Norwegians with gas-powered cars pay about $9 a gallon to keep them moving. Put it all together, and in just one year, Norway's EV population doubled to its current total of almost 25,000. At this rate, that once-ambitious target of 50,000 could be met by the summer of 2015. EV proponents are ecstatic. Electric cars, they say, are quieter and good for the environment. That's especially true in Norway where 99 percent of generated electricity comes from clean hydropower. But there is a "snake in paradise," as users in an electric car chat room described one critic. In his neat little office at Statistics Norway, Bjart Holtsmark doesn't appear particularly serpentine. This is a man who bikes to work and mostly studies the economics of carbon trading. But as one of the few vocal critics of Norway's EV policy, he isn't the most beloved person among electric car components. Holtsmark has crunched the numbers and figures that Norway is currently subsidizing each Nissan Leaf — about half the EV population — to the tune of $8,000 per year. In the U.S., by comparison, EV owners are eligible for a one-time federal tax credit of up to $7,500 and a variety of other incentives that vary by state. Using that $8,000 figure, Holtsmark goes on to calculate that, in terms of its EV policies, Norway is paying $13,500 per ton of CO2 reduction. A ton of CO2 on the European permit market costs $5. "If we should have such high subsidies for electric cars in Norway, it must be the goal that electric cars could be a solution for the rest of the world also. You can't have these subsidies only to introduce electric cars in Norway," Holtsmark says. Unfortunately, he says, the rest of the world is far from ready. Norway has a lot of renewable energy, but fossil fuel accounts for the bulk of the world's electricity production, he says. "If you introduce electric cars on a large scale today, it would actually probably increase the greenhouse gas emissions in the world, not reduce them, because the high share of fossil fuels in the electricity market," he says. At this point, the debate explodes into a many-headed monster of the dueling-science variety. But regardless of whether the Norwegian example could or should become a model for the rest of world, it has proven a couple of things. Physically, electric cars may be scrappier than once thought. "Norway is a hopeless country," says Snorre Sletvold with the Norwegian Electric Car Association. "We have the cold climate, we have a lot of long distances, we have the topography." And yet, he says, here it is, the "kingdom of EV." The other lesson? Where there's a will — and a sizeable incentive — there's a watt.